It's been awhile since my last paper jewelry post... not because I didn't want to do another; heck no, it's one of my favorite topics! Just thought I'd better give other types of paper art and craft a fair shake, but fear not, because I've been saving up lots of beauties to showcase today. 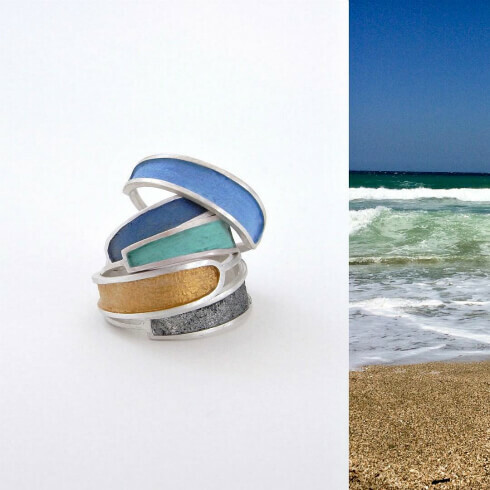 I was delighted to see Silina Pandelidou of Silinarte is now on Instagram (@silinarte). She continues to design pieces that keep summer memories alive all year long. 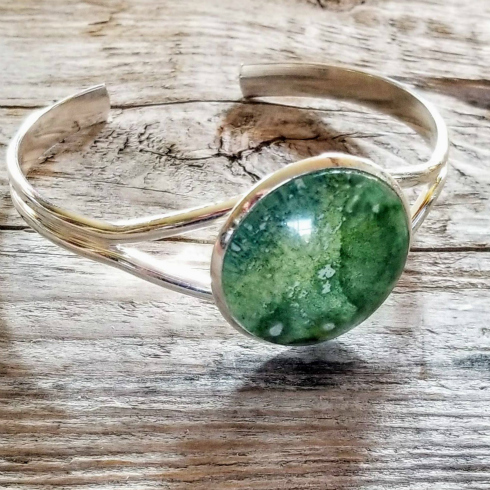 I'd first featured her handmade jewelry five years ago... I loved it then and I love it now... spare, modern, and rustic, all in one, with bright pops of colorful paper. Rosanna Frapporti has been a paper artist since 1980, working frequently with Cartotecnica Rossi crepe paper. 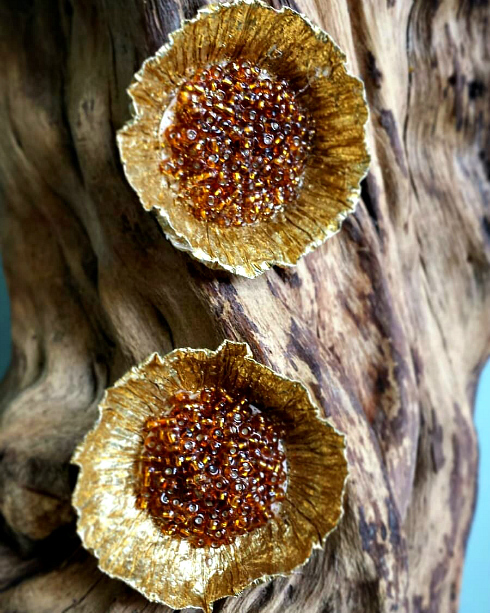 Her creations are small works of art and each is sure to be noticed. 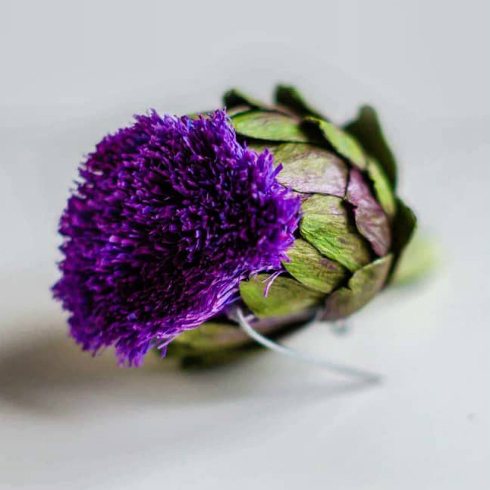 How unusual is this artichoke brooch? 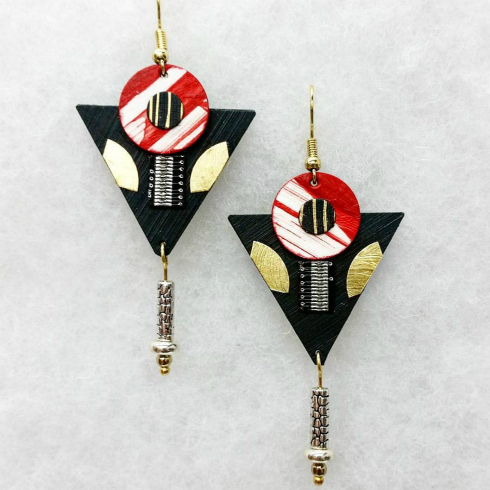 She describes these metallic paper earrings as having something royal and humble at the same time. 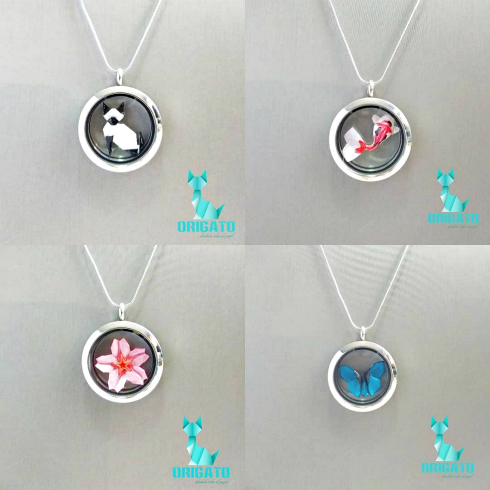 Origami lovers will appreciate necklaces from Ramón Morales and Sue Escobedo of Origato Papiro in Mexico. Made of shiny stainless steel, the locket-style finding encapsulates a teeny-tiny hand folded and hand painted paper figure. @origatopapiro is on Instagram and Facebook (by the way, prices shown are pesos, not U.S. dollars). Nancy Yoshii of Nancy Yoshii Studios on Long Island, New York is a fine craft artist who works in a variety of mediums and enjoys upcycling discarded materials. 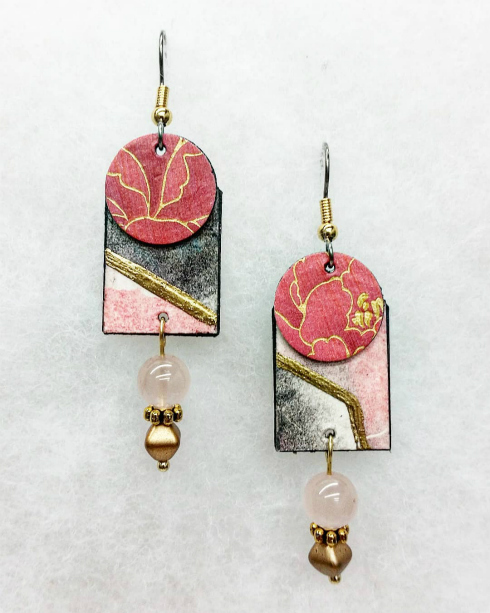 Her bold paper and mixed media earrings caught my eye on Instagram (@nancy_yoshii) and Facebook. Each pair makes a statement and shows the influence of having spent many years in southern Japan. In 2017 Nancy posted a different pair of earrings on Instagram each day from January 1 - December 31. "Boy, did I learn a lot about both persistence and design; it was a great exercise." 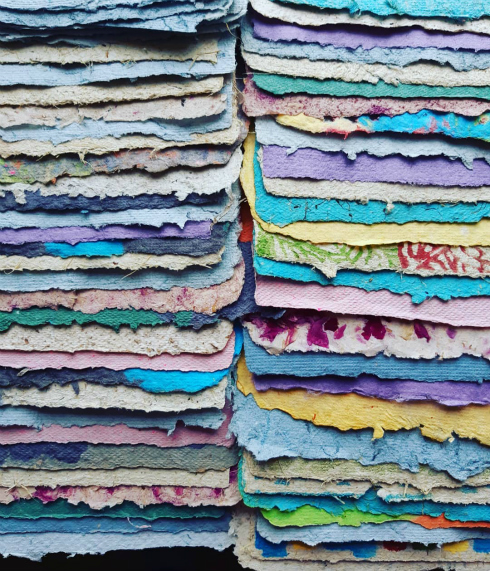 Karine of La Dentellière de Carton in southeastern France makes jewelry and decorative items from paper and corrugated cardboard. 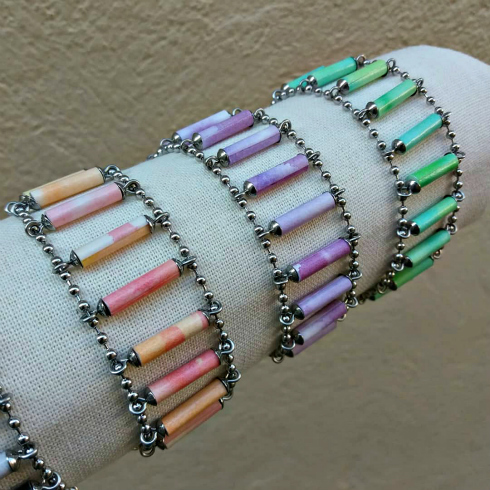 I'm admiring the colors and lines of these paper bead and stainless steel cuff bracelets. If you're lucky enough to visit the French Riviera, you'll find them at Planet'creations in the village of Mougins. You can also contact Karine via her Instagram feed, @dentellierecarton and see more on the La Dentellière de Carton Facebook page. 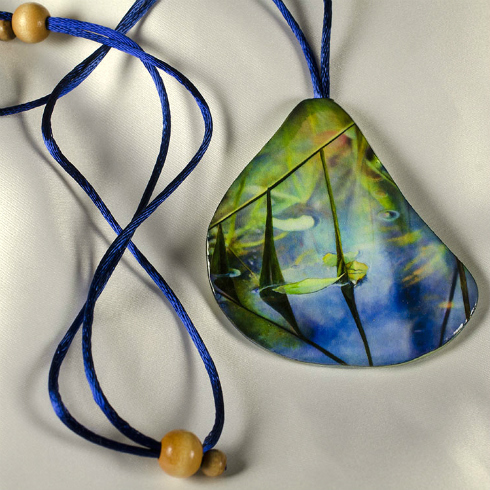 Lolla Nutter of Papyrus Jewelry in Alberta, Canada creates one of a kind resin-coated pulp and fiber pendants that she cuts from paper made with a deckle. Each sheet incorporates flora, fruit, vegetables, herbs and/or spices. An avid gardener, Lolla grows some of the plants herself or harvests them locally, and is constantly experimenting by adding fragments to paper pulp. It's very important to her to use eco-friendly materials whenever possible. 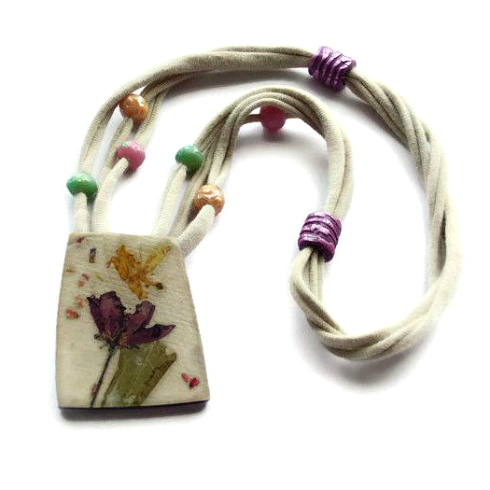 In fact, most of the necklace cordings are made from upcycled t-shirts that Lolla washes, air-dries, cuts and stretches. Papyrus Jewelry is on Instagram (@papyrusjewelry). Look at the variety of papers! Ross Barbera, a landscape painter and educator in the Department of Art and Design at St. John's University in New York, discovered that the layering and gluing of watercolor paper forms a durable substrate. This led to making necklaces, earrings, and bracelets that are essentially miniatures of his original art. Ross's most recent pieces feature printed reproductions of his paintings and are coated with multiple layers of UV protectant varnish. He generously shares his jewelry making methods via how-to videos posted on YouTube as Realistic Art. 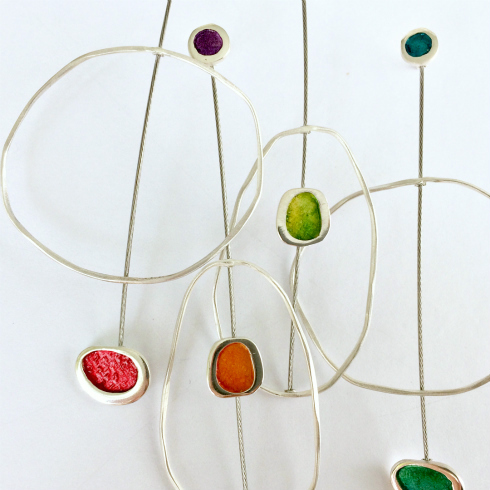 Ross Barbera also has a Facebook page, Jewelry Design and Instruction. Lastly, this bracelet caught my eye in The Sunday Paper. Marcia Passos-Duffy in New Hampshire makes Geo-Graphic Gems by using citric acid to marbleize the ink on vintage National Geographic magazine pages. Such a beautiful result as the highly pigmented ink melds into abstract art. Geo-Graphic Gems is on Facebook and Instagram.